I guess the developer decided that the up button should increase the time and the down should decrease which would make sense if it wasn’t for the fact that the user can see the preceding and following numbers which changes their perspective from the arrows being for numerical incrementing to the arrows being for sliding/rotating the displayed numbers on screen. This entry was posted in Uncategorized and tagged fail, geek, open source, opinions, UI, UX. Bookmark the permalink. I found this very annoying too. I find it is easier to ignore the arrows altogether and swipe over the numbers which act like dials. 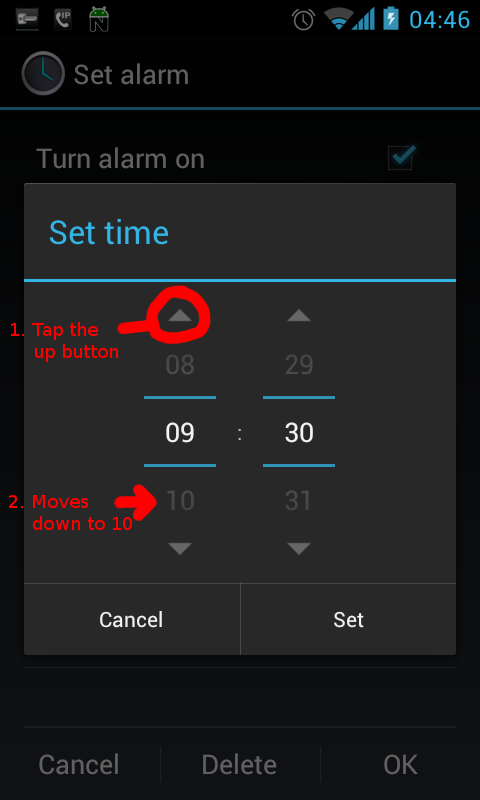 And, upon checking, it appears they have removed the arrows in Jelly Bean. Nice.